OK, so it’s like a thousand degrees outside, muggy and miserable. All that aside (and the fact that you still smell like coconut oil and sunshine) it’s never too early to want a little bit of Thanksgiving, right? And OK. Maybe it’s chicken and not turkey we’re serving up, but you could easily use low carb breading to zshoozsh up about anything, from fish, to chicken, to turkey, to meatballs. Using HoldtheCarbs.com’s LC Breading and Crusting Mix, I have found my favorite product so far (and that’s hard to say out of the many offerings they provide). It’s cooking kismet! Generally, when a product is provided for review, I admit to sometimes not paying too close attention to the actual instructions; I deal with a house filled with picky eaters. With this breading mix, however, I took the chance–and we’re glad we did–with one small caveat. The mix itself contains some pepper and parsley, but it is pretty bland, since the flavor of the flax seed meal ends up coming through pretty decisively. For that reason, I recommend also adding garlic and recommend dredging the chicken with ranch dressing and cream for a little bit of added punch. All that said, I don’t even really like chicken–so this breading helped me to like it again. In fact, this is one product I not only highly recommend, but will be buying again to keep my cabinets stocked. The breading in this recipe came out crisp and delicious, sliced up nicely, and adhered to the chicken, even during baking, when juices from the meat tend to cause breading to drop. 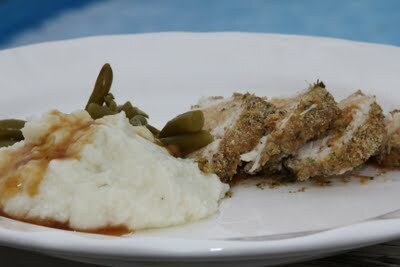 The breading kept the chicken more moist, too–another reason I love this product. Pair with the LC-enhanced mashed fauxtatoes and you’ve got dinner. Mix garlic with LC Breading and Crusting Mix in a ziploc bag. Set aside. In a medium bowl, mix heavy white cream with ranch dressing. Dredge chicken first in cream/dressing mixture. Cover in Breading and Crusting Mix. Place on a lightly greased pan. Bake for 30-45 minutes, uncovered, until chicken is no longer pink. Turn occasionally for even browning. Calories for the Ranch Chicken? Good question! I have no idea. I’ll try to get those numbers run, pronto. Thanks for letting me know! I continue to be impressed at your promptness. I used Atkins baking mix, which is bland and could have used more seasoning than garlic. (I think I’m getting immune to garlic flavor as I use it a lot…hee hee). I was hoping for more ranch flavor and will broil it next time for more crustiness. Thanks so much for your hard work on this site! I love it and refer to it all the time! I’ve started a running challenge I joined on FatSecret. Wow! Tweaking my Atkins plan to get more calories and eat more clean…less sweeteners, no soda… I’m going to force my body to lose these last 15-20 lbs! Keep up the good work and I’ll check back for calories. Hey there! I added all of the nutritional information per serving. Jamie! You rock! Thanks so much! You continue to impress! None of the links for the products in this recipe seem to be active, although I found them on my own. Thought you may want to know in case you’d like to update them.